When Marion J. Renner of Goodland made house calls, he took his doctor’s bag and his pilot’s license. From the 1930s through the 1960s, "The Flying Doctor” served the remote areas of northwest Kansas, sometimes flying 50 miles each day to check on a heart patient or up to 300 miles for an emergency at an isolated ranch. For many northwest Kansans in the mid-twentieth century, Dr. Renner’s flying house calls were often the difference between life and death. 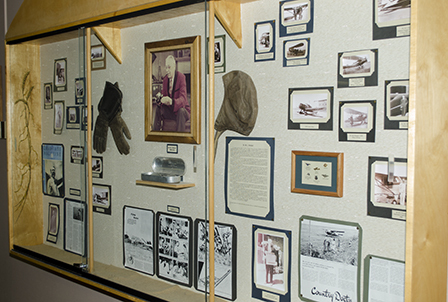 An airplane is a pair of seven-league boots to a country doctor,” observed "Doc” Renner. His airplane aided him in difficult calls, including flying above 15 miles of flooded roads to deliver several babies or landing between snow drifts to fly a desperate patient to the hospital. 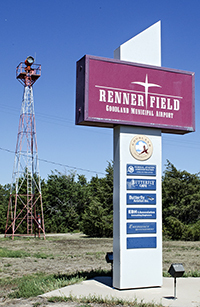 Goodland named its airport Renner Field after The Flying Doctor and a display about him hangs on the north wall of the terminal's waiting area. Open Monday-Friday 6 a.m.-3 p.m.; Saturday-Sunday 6 a.m.-2 p.m.
Butterfly Cafe is just past the Renner display. Enjoy their pies and homemade strawberry rhubarb jam. If flying into Renner Field, call ahead on Unicom frequency 122.95. Standing at the terminal entrance is a non-working model of "America's First Patented Helicopter". See a full-size working replica at High Plains Museum. A historic hangar stands at the entrance to the Renner Field terminal's parking lot.